This local, but widely-dispersed aquatic, once known in the London area, is generally found in the Northern Temperate Zone in Europe, except in Spain, Greece, and Turkey, and Western Siberia. In Great Britain it is found in the Peninsula province in Somerset; in the Channel province, in S. Wilts, Dorset, N. Hants, Sussex; throughout the Thames province and Anglia; in the Severn province, not in Gloucs, Monmouth, Hereford; in Wales, only in Carnarvon, Denbigh, Flint, Anglesea; but throughout the Trent, Mersey, and Humber provinces; in Durham and Westmorland, from which last it ranges to the south coast. It is found in Down in Ireland. Water Violet is an aquatic plant, which is local but uniform in its habitat, frequenting the larger tracts of water in England and Wales, especially where still but not stagnant pools exist. It used to be found in Battersea Meadows, but is extinct there owing to drainage, and its occurrence is much more restricted than formerly. It is also a marsh plant, growing in wet, peaty hollows. There is no doubt that it was originally terrestrial, and that it has but recently adopted an aquatic habitat. 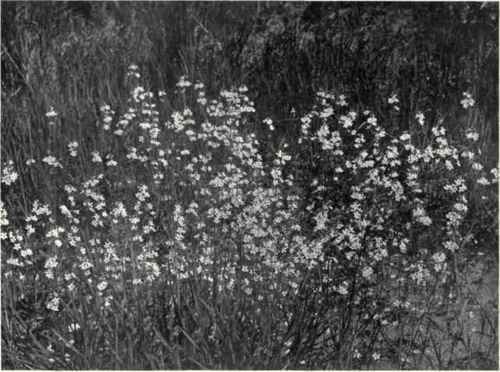 Water Violet is a floating plant, with fine, white, capillary roots, which penetrate deep into the mud. The aerial stem is a scape, and leafless. The leaves are not perfect whorls, submerged, with leaflets each side of a common stalk, in tufts, and prostrate. The flowers are white, lilac, or pale-purple, and borne in whorls, stalked, growing on a long-stalked scape, which is naked and smooth. The flowers are in spikes. The corolla greatly exceeds the calyx, and is salver-shaped, the petals being notched at the extremity. The oblong anthers are yellow. The raised aerial flower-stalks indicate the plant's former terrestrial origin. The seeds are oval, inserted in a receptacle within the capsule. The plant is I ft. in height, and flowers from July to August. It is perennial, propagated by seeds, and worth cultivating. The flower is dimorphic. The stamens and pistil are relatively in the same position as in Primula. The flowers of the Water Violet may be cleistogamic. Honey is secreted by the ovary. The tube is 4-5 mm. in both forms, the male and female organs standing, in one in the entrance, and in the other projecting 3-4 mm. When damp the pollen-grains in the long-styled form are spherules .011 to .014 mm. broad, and in the short-styled form they are .018 to .023 mm. The stigma is rough and velvety in the former, and the papillae are larger than in that of the latter, which is fairly smooth. Organs of equal height are touched by the same parts by insects seeking honey, cross-pollinating the flower legitimately. Those which feed on pollen do not thrust the head into the flower in short-styled forms, and do not touch the stigma, which they touch only in long-styled forms, where they have to thrust the head to reach the pollen, and visits to several of these running cause illegitimate cross-pollination; and where it is more effective than in short-styled forms, because probably the latter are fewer and the former alone useful. It is visited by a Hymenopterous insect, Pompilus, and the flies Empis, Eristalis, Rhingia.